Union Pacific has always been on the cutting edge of locomotive technology. In the 1950s, it became the only railroad ever to place a fleet of gas turbine-electric locomotives into regular mainline service. Here is the whole turbine story, from rare footage of an early steam turbine experiment in 1938 to the first gas turbine demonstrator in 1948. UP put 55 production units into service, the largest rated at 8,500 horsepower each-the most powerful locomotives ever built! You"ll see the demonstrators and all three production models (including the unique "Veranda" models) hauling tonnage on scenic mainlines, moving through yards, and being serviced in engine terminals alongside steam engines and classic F-units. Along the way you"ll learn how turbine locomotives operate and will explore the differences and similarities between turbine-electric and diesel-electric units. The saga ends with an experimental coal-burning turbine locomotive built by Union Pacific itself in 1962. A special treat included in this program is a General Electric promotional film produced in 1938 titled "The Steam-Electric Arrives!" Two Hi-Fi soundtracks, one with the natural train sounds, the other with narration added. The viewer can switch the narration on or off at any time. Adam O (Chicago) on 2011-11-21 23:12:20. 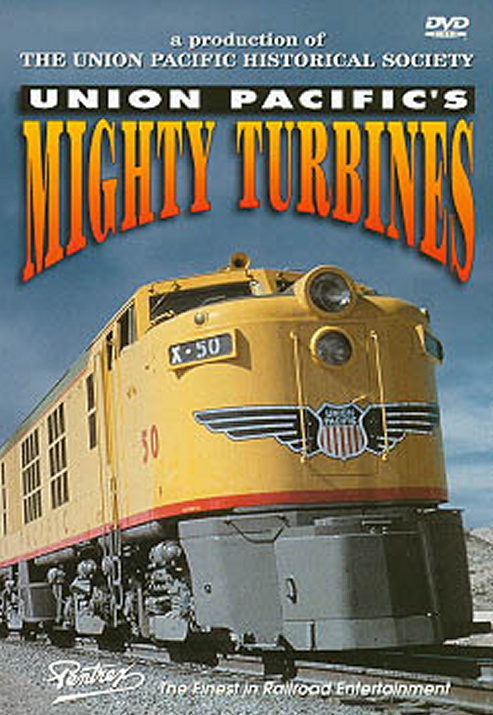 Great DVD, as I'm only in my early 20's I never got to hear or see a running turbine locomotive, this video does a good job presenting them as they were when active and not on static display. I think the DVD could have used more of the engineering info on these units, but otherwise a great film to watch, if you enjoy horsepower you'll enjoy this DVD. Jeffrey Ornstein on 2009-08-27 16:40:18. Produced in the documentary style, this dvd chronicles the development of UP's gas turbines from the 1930's through the 1960's. The show begins with a film from GE on the very first turbine experiment in 1938. We see the locomotive under construction, and then in testing and some short scenes in revenue service. The GE film is in B&W. We then take a look at all three turbines that went into production, including a couple of experimental turbines - a double ended unit and a coal-burning unit that was rebuilt from an Alco diesel. There's nice footage of the Veranda turbines - something which is somewhat hard to come by. Many of the images we see are of the locomotives in pristine condition, allowing the viewer to enjoy the details of these monster power-houses. The main show is a combination of color and B&W, but this does not detract from the show. Pentrex did a good job in cleaning up the films and the digital restoration is impressive. The only real downside? It's 45 minutes, less than the usual Pentrex video. dmacleo (Maine) on 2014-06-26 16:44:52. I liked this, wish we had some good cab views of it though. the footage is really old so its hard to judge it on that. some really interesting stuff. Jim (Waxahachie, TX) on 2013-01-27 21:25:57. The video was interesting if you are keen to the turbine era. I have purchased other video from Pentrex which I find more interesting. I model the late forties to the late sixties, so therefore I find motive power and passenger service of more intrest. Narration: A little bit too much. Now this is the great one on UP TURBINES, great quality, great story from the early ones to the later ones, great behind the scenes footage, a lot of DVDs you only watch once and then store away, but this I can watch over and over! On the turbines it does not get any better and never will! If this is your interest, this is a MUST HAVE! Really liked the video and the sound of the turbines was the best part. From start to finish the video didn't have one boring part. A Ryniec on 2009-08-30 21:28:41. The history and progression was done OK but the content was light and short to say the least. I especially didn't like that the videos cut off after the engines past and didn't show the ends of the trains like the caboose. If someone is modeling these trains, they would want to get the caboose correct as well as the engines. I also would have liked to see more about the servicing of these turbines along with more detail on the routes they were used on. I have bought Pentrex videos before and I would say that this one has been the most disappointing to date. If you want to model cabooses get some still photos! And this is one of Pentrexs best! The other guys agree with me, what were you watching?